The bathroom is one of the most important rooms in any house and provides homeowners with essential services throughout the day. When residents want to remodel their bathrooms, their trade pros come to ProSource® of Tucson to pick out high-quality products and materials at unbeatable wholesale prices. 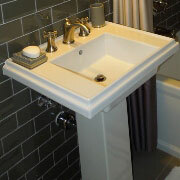 At ProSource of Tucson, our vast selection of bathroom sinks rivals that of our competitors, both in quality and price. For trade pros whose clients don’t have much room to work with, our pedestal and semi-pedestal sinks are the perfect space saver for their small bathrooms. When it comes to large, ambitious bathroom remodels, we suggest our stunning wading pool or vessel sinks to trade pros and their clients. We offer the best selection of bathroom sink faucets on the market, complete with options that are affordable, practical, and trendy. 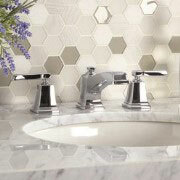 Here at ProSource of Tucson, your client will find the perfect faucet to accent their brand-new bathroom sink. Trade pros regularly bring their clients in to our Tucson showroom and ask us to give them the lowdown on our shower options. From spacious interiors with sophisticated glass features to simple designs that save space, our selection of wholesale showers is worth a visit to your local ProSource. 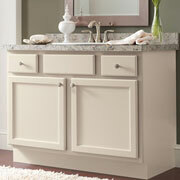 Nearly every modern home has bathrooms complete with beautiful vanities that stretch from wall to wall, provide a trendy centerpiece, or fill an empty corner. No matter what function your client’s vanity will serve, bring them in to ProSource of Tucson and we’ll walk them through all our vanity sizes, styles, materials, and colors. 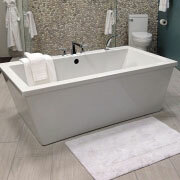 Bathtubs can serve as a focal point of any bathroom and come in a wide range of types, sizes, styles, materials, and colors. Here at ProSource of Tucson, we proudly supply trade pros and their clients with the perfect alcove, corner, freestanding, and clawfoot bathtubs for their bathroom remodels. Here at ProSource of Tucson, we take environmentalism seriously and provide our trade pros with low-flow toilets in the best size, shape, material, and color for their client’s bathroom remodel. 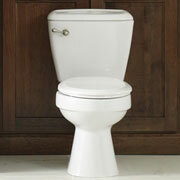 Whether your client lives in the desert and likes to conserve water or simply needs a new toilet, stop by your local ProSource showroom today and we’ll help you pick the toilet that best serves their needs.